Solution: It indicates that there is a connection issue. 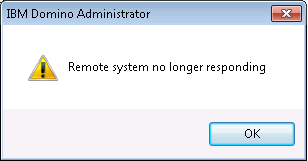 Lotus Notes is unable to access the Domino Server. As Notes and Domino are synchronized and CommonStore might not afford to wait too long for the Domino Server to respond. This error is due to slow network problems and can occur at irregular intervals of time. It is necessary to check the network connectivity with Domino Server, if the problem is consistent. But if the problem is occasional, then there is no need of any action. The failed archive email messages will be selected again when the CommonStore crawler runs again. But if there is no issue in network connectivity then you have to contact the IBM support for further help. Cause 2- Lotus Domino Server is either disconnected or brought down for maintenance. Solution: Any software/hardware problem in Lotus Domino Server can be responsible for network connectivity. Wait until the server is responding. You need to stop all the work. If a person is creating or editing any document, then he must save the document in his mail file by choosing Actions >> Forward. You can make any changes in that document. And when the server is available again, then you can copy and paste the information in the document on the sever with the information you have edited.